I am an unapologetic taco lover. Love, love, love them. Always have since I was a kid. But here’s the thing – I’ve only ever had the traditional ground beef tacos. I’ve heard rave reviews of fish tacos and have been wanting to try them for some time, but obviously have fallen short. Until now. See, part of the thing is that I’m not a huge fish person. Shrimp, salmon, crab, sushi, all good. Also, cannot forget battered cod sandwiches, those are killer. 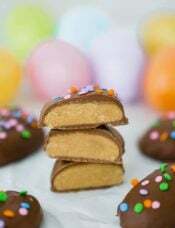 And they should be in abundance soon with Lent right around the corner! But all those other types of fish? Trout, bass, snapper, etc? Meh, never appealed to me. Well, let me tell you. I am officially converted because this is, hands-down, one of the best meals I have made in a long, long time. 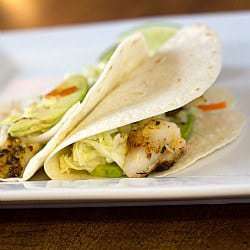 You can use red snapper or striped bass for this recipe. 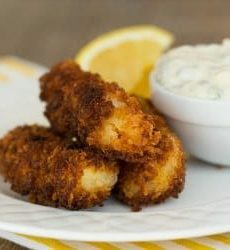 You rub down the fish fillet with a spicy herb mixture, let it marinade for a short time, and then grill it over high heat. Since there is still snow on the ground here, I used an indoor grill and had great results. 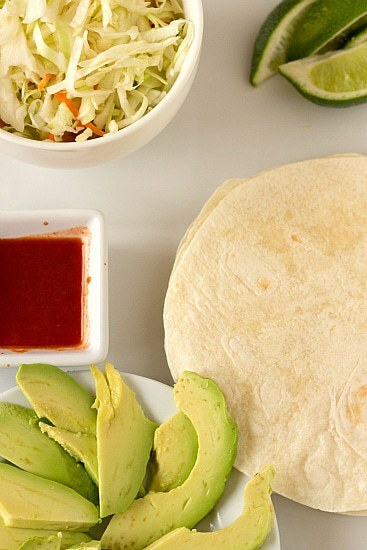 Serving suggestions include shredded green cabbage, avocado, hot sauce, sour cream, pickled vegetables and some fresh lime juice. You can of course top them with whatever you’d like, but this combination of flavors is positively suburb. 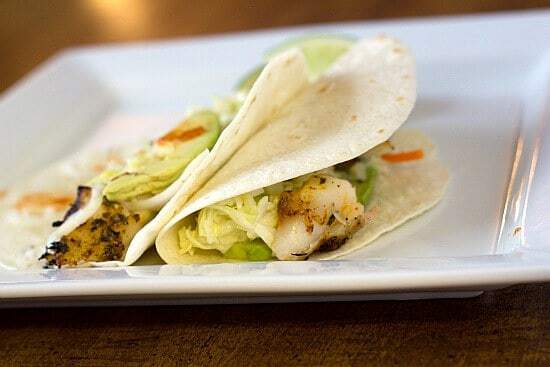 The fish is really mild and has a great smoky flavor from the rub; pair that with cabbage that’s a little salty, creamy avocado, tart pickled vegetables, a dash of hot sauce and cool sour cream and you have a seriously amazing taste buds dance party. 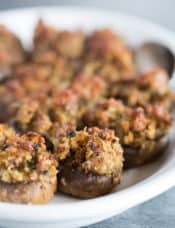 Back at the beginning of the year when I shared some of my favorite healthier recipes from the site, I also put a list of bestselling healthy cookbooks on the sidebar. Well, the editors at Whole Living saw that I had their book, Power Foods, on the list and asked if I’d like to check out a copy. I said sure, and have since really fallen in love with the book. 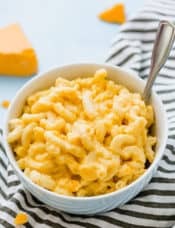 Not only are there tons of great (healthy) recipes like this one, but they also go through 38 “power foods” that are great to include in your diet. While it probably appears that I subsist primarily on butter, sugar and chocolate (with a side of cream cheese), that actually couldn’t be farther from the truth. I strive to eat mostly clean (nothing processed) meals the majority of the time – whole grains, fruits, vegetables (this is the hardest for me! ), very little sugar, etc. 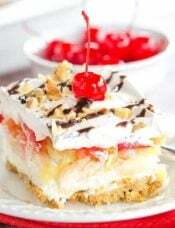 So when the time comes to have a sweet treat I allow myself the indulgence, and then share the love with others. And since watching Food, Inc. a few months ago, I have been eating significantly less meat and poultry, so meal options like this one are great to have in my repertoire. To enter to win a copy of the cookbook Power Foods, leave a comment on this post sharing your favorite healthy eating tip. 1. Subscribe to Brown Eyed Baker by either RSS or email. Come back and let me know you’ve subscribed in an additional comment. 2. 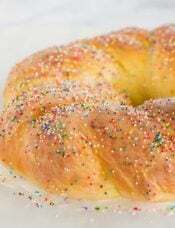 Follow @browneyedbaker on Twitter. Come back and let me know you’ve followed in an additional comment. 3. Tweet the following about the giveaway: “RT @browneyedbaker: Cookbook Giveaway! 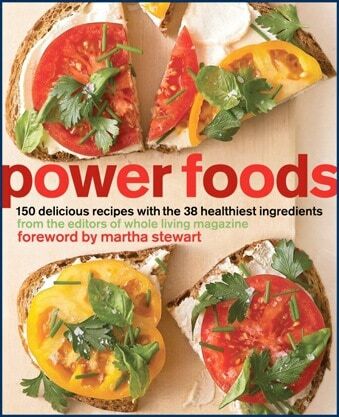 Enter to win a copy of Power Foods: http://bit.ly/gJbHWs”. Come back and let me know you’ve Tweeted in an additional comment. 4. Become a fan of Brown Eyed Baker on Facebook. Come back and let me know you became a fan in an additional comment. Winner: The winner will be chosen at random using and emailed. If the winner does not respond within 24 hours, another winner will be selected. 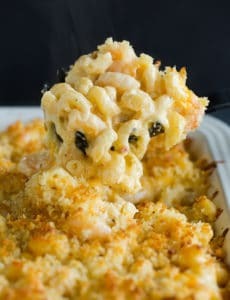 Disclaimer: The cookbook is provided by Martha Stewart Living Omnimedia, Inc. This giveaway is now CLOSED. Congratulations to commenter #24, Mariah! 2. Stir together cumin, oregano, chili powder, and 2 teaspoons salt. Mix in the olive oil and cilantro. Use a sharp knife to make shallow slits about 1½ inches apart into the fish skin; transfer to a large dish and rub both sides with spice mixture. Refrigerate, covered, for 30 minutes to 2 hours. 3. Toss together cabbage and 1½ teaspoons salt in a medium bowl. Let sit 30 minutes. 4. Heat grill (or grill pan) to high (if using a charcoal grill, coals are ready when you can hold your hand 5 inches above grill for just 2 to 3 seconds); lightly oil grates. Place fish, skin side up, on grill. Cook, without moving fish, until opaque throughout, 3 to 5 minutes. Carefully flip, using two spatulas if necessary. Cook until fish flakes slightly when pressed in the center, 5 to 7 minutes more. 5. 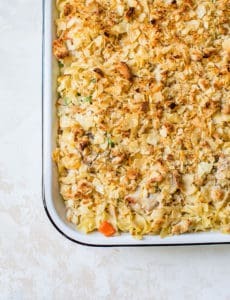 Transfer fish to a serving platter; let cool slightly, then shred with a fork into bite-size pieces. 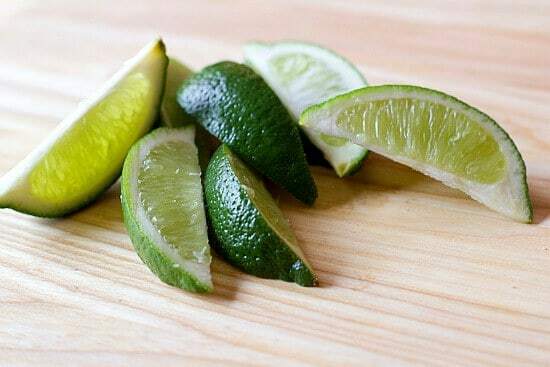 Garnish platter with lime wedges and cilantro sprigs. 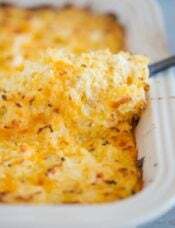 Serve warm or at room temperature (within 1 hour). 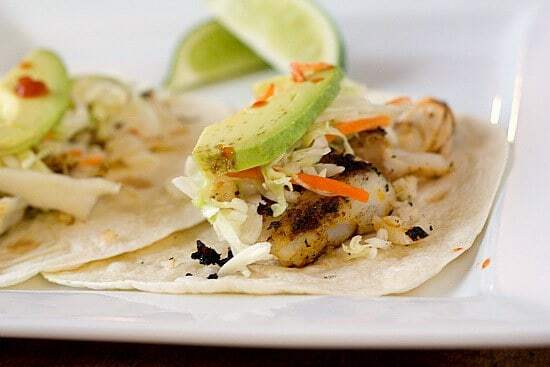 Allow guests to assemble their own tacos, layering fish with cabbage, avocado, sour cream, hot sauce, pickled vegetables, and other toppings, as desired. We had these last night. The pickled veggies were the unexpected ingrdient that everyone could not get enough of and felt balanced the flavors in a way we could not get enough of these tacos. Served as described with the only modification being Greek yogurt in place of the crema. Not sure if it was the ingredients, the preparation, the company or the view of the lake, but these were the best fish tacos I’ve ever eaten.